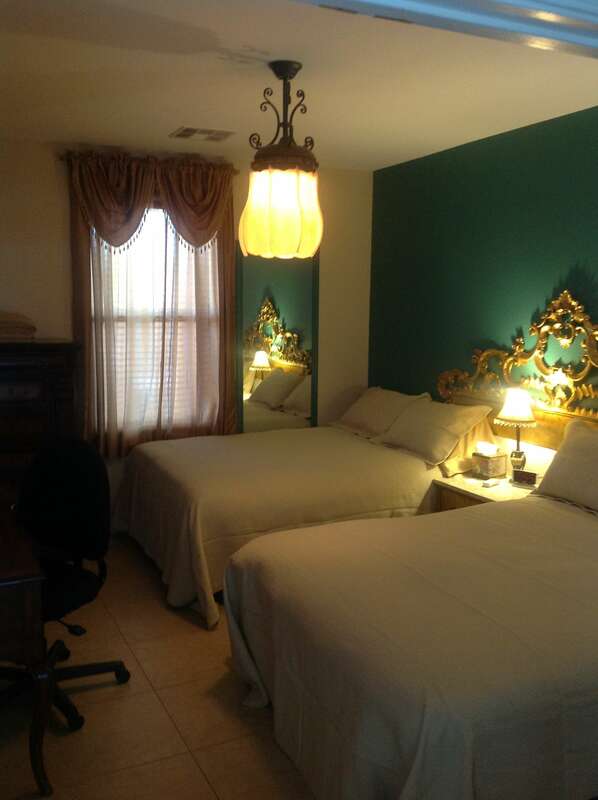 This private room has either one or two queen beds (as needed) and is located downstairs. A private full bath with glass-enclosed granite shower and toilet is adjacent within the French door access down a private entrance hall. There is no closet in this room, but plenty of storage is available with a high boy plus a large armoire is available for personal use in the entrance hall to the suite. This is the only downstairs sleeping room. This room is great for a single person or a couple looking for a comfortable private room to relax in comfort. Room amenities include wall-mounted TV with cable, a writing desk with task chair of bariatric specifications. Listed is the base rate that includes the $50 per day private bath upgrade. Special needs include private bath or suite, geriatric or morbidly obese accommodations. Parking for guest vehicles will require an additional $20 daily fee per vehicle. Rates include room accommodations, personal training, and wellness coaching, your choice of authorized foods provided for 4 supervised and self-prepared meals + 2 shakes and bottled water. For more about the accommodations click here. The Fitness retreat accommodations are only available to clients. Rates include room, semi-private personal training, and choice of self-prepared foods provided.